You can delegate paragraphs, decision tables, and data types to your business users. Delegation promotes ownership of business-facing rules to the business line. For example, you can delegate a decision table to a business line manager. The line manager views the decision logic in a familiar environment, such as the Case Manager portal, and can update it as a standalone item without knowing all of the related, technical details. 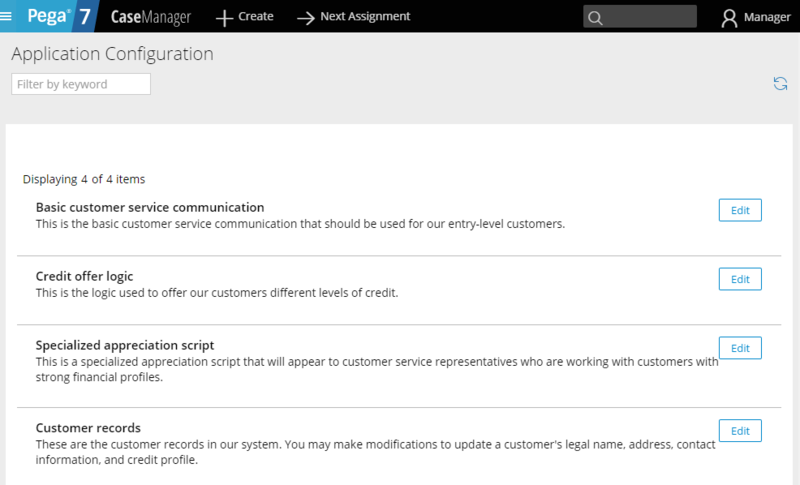 Delegated items are displayed on the Configuration dashboard in the Case Manager portal. Open the rule or data type that you want to delegate. For example, to delegate a paragraph rule, open the paragraph rule in Designer Studio. ​For example, the Manage content option is displayed for paragraph rules, for which users can modify content. 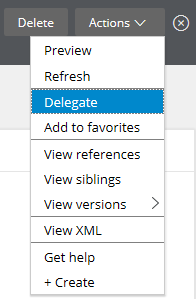 Assign the delegated record to an access group. All members of this group can access the delegated record. Provide a title for the delegated record. In the Detailed description text area, describe how the delegated record affects the application. This description is shown to the business user in the Configuration dashboard in the Case Manager portal. 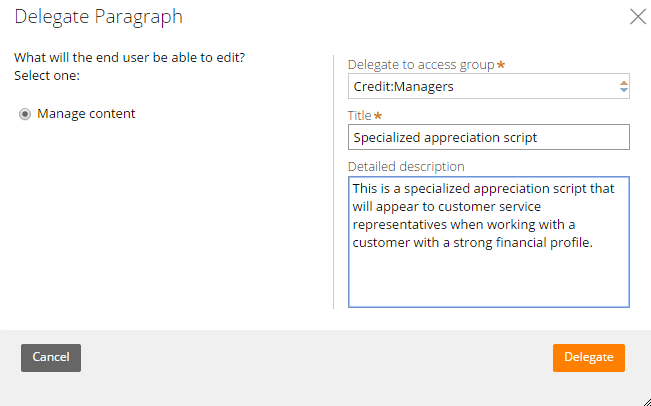 Detailed description: "This is a specialized appreciation script that will appear to customer service representatives when working with a customer with a strong financial profile."